Title: 06/20/1989 - Application of the Hazard Communication Standard to prescription drug products. This is in response to your letter of March 15, addressed to former Assistant Secretary John A. Pendergrass, regarding the application of the Hazard Communication Standard (HCS) 29 CFR 1910.1200 to prescription drug products. Material Safety Data Sheets (MSDSs) are required for all drugs as defined in the Federal Food, Drug and Cosmetic Act except for drugs in solid, final form for direct administration to the patient (i.e., tablets, pills, or capsules). The package inserts and the Physician's Desk References cannot be accepted in lieu of requirements of MSDSs under the present rule. The MSDS provisions for drugs are being enforced in response to the order of the United States Court of Appeals for the third Circuit. 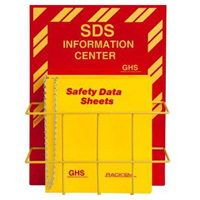 The provision and maintenance of material safety data sheets is an integral part of an employer's hazard communication program. Therefore, lack of MSDSs for covered drug products cannot be considered a de minimis violation, since they do have a direct or immediate relationship to safety and health. We appreciate the opportunity to address your request. Please do not hesitate to contact us, if you have further questions. On behalf of the National Wholesale Druggists' Association (NWDA), I hereby ask your assistance, and by copy supplement the position offered at the public hearing on the hazard communication standard as it would apply to prescription drug products. Of primary concern to this association, its members, and their pharmacist customers is the massive proliferation of paperwork in the form of MSDSs, to communicate information about chemicals in prescription medicines to the professional pharmacists and medical personnel who administer those medicines. As noted often in our comments and testimony, existing alternative sources of information already communicate substantially the same information in a format that is familiar to these employees and is in daily use in the medical community. Examples of available alternative sources are professional package inserts supplied with each package by the manufacturer, and technical compilations of this information such as the Physicians Desk References. In our various filings, we have described the massive economic and practical impact of creating, reproducing and distributing tens of thousands of MSDSs to meet the literal requirements of the hazard communication standard. We have submitted for the record the testimony of one representative member of NWDA, that for his business alone approximately 10,000 drug products appear to be subject to MSDS requirements. 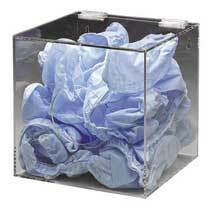 His company distributes to 1,040 customers, virtually all of whom would have to be sent a copy of each MSDS. This would involve the wholesaler receiving, storing, indexing, updating and maintaining 10,000 MSDSs, and distributing a total of 10.4 million copies. Each MSDS has multiple pages, and we conservatively estimate an average length of 4 pages. This single member estimated his business alone would have to spend over $16 million to send out MSDSs from his distribution center. NWDA has 310 members, of which this company is representative, and in the country at large we estimate there are 4,000 drug wholesalers. The costs are real, and they are frightening in their dimension. We noted with favor the OSHA proposal on August 8, 1988, to consider alternative sources of information in satisfaction of MSDS requirements for FDA-regulated drug products. We supported the proposal in written comments and oral testimony. Keep your employees aware of hazards and policies with signs, training materials and more from Safety Emporium. The rule making is incomplete and yet, in the Federal Register of February 15, we read that the literal requirements of the original August 24, 1987, publication, including "coverage of drugs in the non-manufacturing sector," are in effect and subject to enforcement as of March 17, 1989. We understand that government litigation affecting this issue remains pending. It seems both unfair and wholly unnecessary to place the members of our industry and their customers in jeopardy with a threat of enforcement, given the economic and practical considerations involved, while relief in the form of rule making remains incomplete. Accordingly, we implore you to exercise your discretion to consider the use of professional package inserts and published sources of FDA-information such as the Physicians Desk References as constituting substantial satisfaction of MSDS requirements pending completion of the rule making of August 8, 1988. During this period, no citations or only de minimis citations should issue for not having MSDS forms for FDA-regulated drugs. We very much appreciate your consideration of this request and, for the benefit of our members who are exposed to uncertain liability under the standard, we ask for written acknowledgment of your decision. This is in response to your letter of March 28, addressed to former Assistant Secretary John A. Pendergrass, regarding the Occupational Safety and Health Administration's (OSHA) application of the Hazard Communication Standard (HCS), 29 CFR 1910.1200 to prescription drug products. Material Safety Data Sheets (MSDSs) are required for all drugs defined in the Federal Food, Drug and Cosmetic Act except for drugs in solid, final form for direct administration to the patient (i.e., tablets, pills, capsules). The package inserts cannot be accepted in lieu of MSDSs as the insert does not meet the specification requirements for MSDSs under the present rule. OSHA has been ordered by the United States Court of Appeals for the Third Circuit to enforce the provisions for prescription drugs. We hope this information is helpful to you in clarifying the coverage of prescription drug products under the HCS. If we can be of further assistance, please feel free to contact us again. The Pharmaceutical Manufacturers Association is a nonprofit scientific and professional organization of more than 100 firms that discover, develop and produce prescription drugs and biological products in the United States. The Association's members produce most of the prescription drugs used in the United States and about half the free world's supply of prescription drugs. I am writing to convey the Association's support of the request of the National Wholesale Druggists Association that OSHA provide interim guidance regarding the use of FDA-approved professional package inserts to satisfy the MSDS requirements, pending completion of your proposed rulemaking covering this topic as set forth in the Federal Register of August 8, 1988. It is our understanding that litigation affecting this issue is ongoing and as yet incomplete. We concur with the statements made by NWDA of their members that, absent the requested clarification, downstream purchasers of marketed prescription drug products would be subject to extremely burdensome, costly and unnecessary paperwork requirements.